Барааны дугаар 9780199653065. Categories: Dictionaries, OXFORD. This leading dictionary – now in its fourth edition – offers wide-ranging and authoritative coverage of the earth sciences and related topics in over 7,500 clear and accessible entries. Coverage includes geology, planetary science, oceanography, palaeontology, mineralogy, and volcanology, as well as climatology, geochemistry, and petrology. This new edition has been fully updated and 150 new entries added, with expanded coverage of geology and planetary geology terms. Over 130 line drawings accompany the definitions. The Dictionary also provides recommended web links which are listed and regularly updated on a dedicated companion website. Appendices include a revised geological time scale, an updated bibliography, stratigraphic units, lunar and Martian time scales, wind-strength scales, and SI units. 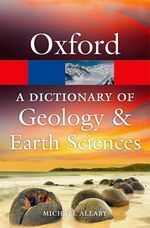 This dictionary is essential for students of geography, geology, and earth sciences, and for those in in related disciplines. Readership : A level and undergraduate students of geography, geology, geosciences, physical science, and related disciplines.